Author Briohny Doyle will appear at a special Literary Lounge event on 4 August. “Whenever someone proclaims that we need to think about the future of our children, I’m a little taken aback. No spoilers, but it’s not looking great,” writes author Briohny Doyle in Adult Fantasy. Doyle, who will be speaking at a special Literary Lounge event at Tuggeranong Arts Centre on August 4th, is the author of climate fiction novel The Island Will Sink and non-fiction work Adult Fantasy. Her writing takes a close look at the changes taking place in our present moment and the dystopic possibilities of our near future. 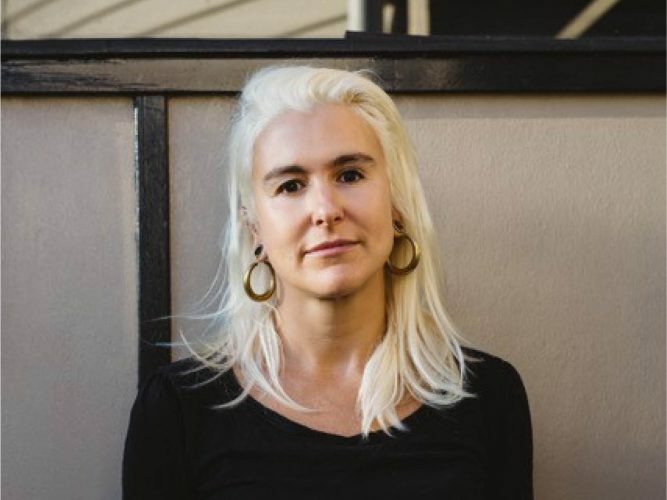 Doyle burst onto Australia’s literary scene when her debut novel, The Island Will Sink, was published by Brow Books in 2016. Set in a dystopic near future, the novel tells the story of Max Galleon, a successful film director whose latest immersion cinema project tracks the real-time sinking of Pitcairn Island. While the novel imagines a future when the global catastrophe chain of climate change is live streamed into our homes and our every emotion is automatically logged into a database, her second book, Adult Fantasy, finds some of the origins of this future in our present moment. Adult Fantasy is a masterful blend of personal essay and cultural critique that questions how millennials can define adulthood in an era of rapid social change and increasing uncertainty. Without the traditional markers of careers, mortgages, marriage and children, Doyle asks: How can this generation define maturity? Far from fuelling debates about intergenerational wealth with easy stereotypes of cashed-up boomers and lazy millennials who have a penchant for smashed avocado, Doyle’s work is an empathetic and nuanced look at the social and political changes that make the world of today vastly different from the one previous generations came of age in. The outlook though, at least in Doyle’s assessment, can be rather bleak. Housing continues to be increasingly unaffordable, global economies are uncertain, employment is being rapidly casualised, and climate change threatens – quite literally – to drown us. Even our pets are at risk. From the adopted dog of the real life Doyle, who is unable to keep him in her urban rental, to the non-native bunny whose affection threatens to undermine young Lilly Galleon’s eco-ethics in The Island Will Sink. All of these challenges, and perhaps a solution or two, will be discussed when Doyle appears in conversation for a special Literary Lounge event presented by Tuggeranong Arts Centre and the ACT Writers Centre. ‘Dystopia with Briohny Doyle’ is on at Tuggeranong Arts Centre at 3 pm on Saturday 4th August.